Kimberly Reed’s political thriller uncovers intricate schemes of illegal election funding in her home state of Montana, the perfect case study. Your vote can be bought, but at what cost? 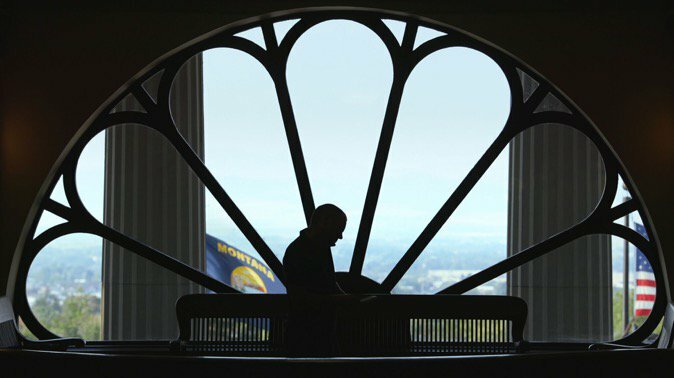 Dark Money follows local Montana journalist John S. Adams, who is determined to uncover the truth about funding in his state’s elections. The film gains insights over the course of three election cycles, as it solves an increasingly complicated and blurred puzzle. Dark Money traces Adams’ steps and sheds light on the grassroots movement to unveil the mysterious financing behind our elections. Dark Money has its national broadcast and streaming debut on the PBS documentary series POV and pov.org on Monday, October 1 at 10 p.m. (check local listings). POV is American television’s longest-running independent documentary series, now in its 31st season. Filmmaker Kimberly Reed, whose family has lived in Montana for four generations, dives into these questions specifically as they regard the state. “People in this state had a good sense of history about the excesses of capitalism, because that’s essentially what it is. It’s in your face here. You can’t really ignore that,” says Cheri Maclean, a Montana voter. John S. Adams, former capital bureau chief for the Great Falls Tribune and creator of the Montana Free Press, is the leading investigator featured in the film. He notes that when campaigns can receive unlimited sums from anonymous donors, hidden from public scrutiny, the consequences are clear: “Then it’s not the people controlling the government—it’s the government controlled by a corporation controlling the people, which is like super-crazy Big Brother, but it’s happening.” The film draws parallels between the local influence of dark money in Montana and the effects of corporate political spending on a national scale. Kimberly Reed’s work has been featured on The Oprah Winfrey Show, CNN, NPR, The Moth and in Details magazine. One of Filmmaker Magazine’s “25 New Faces of Independent Film,” she directed and produced Prodigal Sons, which landed on many best of the year lists, screened at more than 100 film festivals and garnered 14 audience and jury awards, including a FIPRESCI Prize. Reed was recognized as one of Out magazine’s “OUT100” and was number one on Towleroad’s “Best LGBT Characters of the Film Year” list. She also produced, edited and wrote Paul Goodman Changed My Life and produced The Death and Life of Marsha P. Johnson. Reed is a fourth-generation Montanan.